Finally, I say! I’m So Excited about the slate frames that are being produced for the general US embroidery market by Access Commodities. Finally, a slate frame that is strong, solid, serviceable, and absolutely meticulously correct in all its details. And – finally – I’ve been able to get one! Yes, I’m a bit of a frame junkie. I have tried them all, you see. And I like many different types of embroidery frames. But the slate frame – that is, a good slate frame – just can’t be beat. I’ve also tried lots of different slate frames over the years. Frames made with very heavy, thick wood that, though well-made, were so cumbersome they were hard to handle and manipulate. Frames made from such thin, light wood that they bowed under the pressure of lacing. Frames that were poorly finished, that needed constant touch-up sanding to prevent splinters and snagging. Frames with roller holes that were too large, so that the frame easily skewed itself with the slightest bump. Frames with twill tape that shredded on the first use. Frames with conical pegs that popped out whenever the frame was set on a flat surface. Frames that I’ve made due with when I needed a slate frame, but never felt satisfied with. Here in the US, the slate frame has not come into its own yet – but it really needs to! I think that, if stitchers could experience the pleasure of sitting down to an embroidery project that is framed up correctly on a good slate frame, and if they could experience the satisfaction felt when removing the smooth, finished piece of embroidery worked on a slate frame, they’d understand why the slate frame is favored at institutions like the Royal School of Needlework. 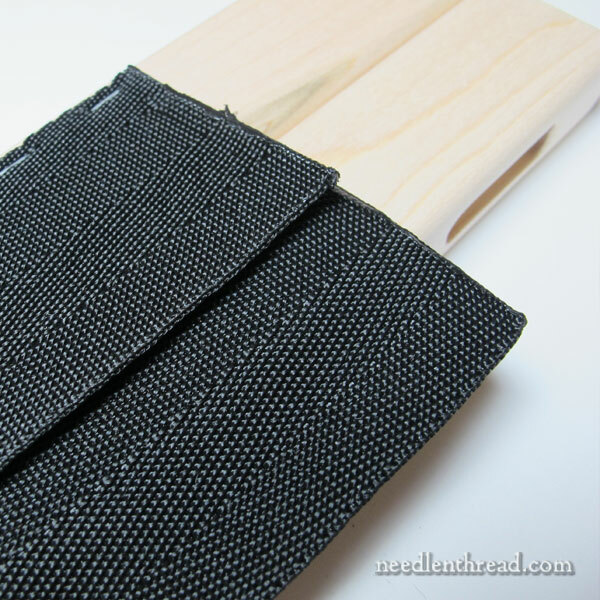 Because the slate frame allows for long-term drum-taut tension for fabric that is framed up square with the grain, it is almost impossible to produce a piece of embroidery – no matter how densely stitches – that is puckered or warped. And although the slate frame takes a little more work to set up compared to a hoop or stretcher bars (you become faster at setting up a slate frame once you do it a few times), it is worth the extra time. When you can sit down at a piece of embroidery that’s laced up tightly on a slate frame two years after you mounted it on the frame, and still enjoy drum-taut tension, that’s a good thing. 1. The wood from which they are constructed is a strong hard wood. It’s not a super-heavy wood that makes the frame unmanageable, but it’s not a light, soft wood that would bow over time. It feels sturdy without being overly weighty. 2. Every bit of the frame is perfectly finished and smooth as glass. Methinks the person making them really knows and loves wood and takes pride (with good cause!) in the work. 3. The rectangular holes on the roller bars are made to accommodate the side slats like a glove. They aren’t tight, so that the slats are hard to push in, but they aren’t loose, either. The slats, once in and pegged, don’t shift. This is how it should be. 4. The twill tape is a firmly woven, finished synthetic twill tape that doesn’t shred and separate when it is sewn. It’s sturdy and a little stiff-ish, but still flexible enough to turn over the roller bars if necessary. 5. Then there’s the question of the pegs. Sometimes, I think the pegs on a slate frame are an afterthought of the manufacturer. But they shouldn’t be! The pegs on a slate frame are critical to the frame. They provide the vertical tension on the frame. They have to hold the top and bottom bars apart from each other, and in between those two bars is a piece of fabric that is under great tension. So the pegs have a big job to do. On many slate frames, you’ll see conical pegs that slide rather far into the holes on the slats. They are just smooth cones of wood. 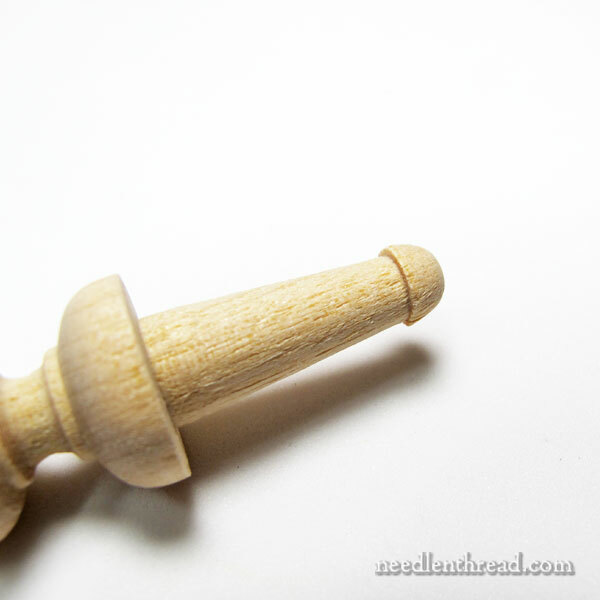 If you want these conical pegs to stay put, you have to jam them in and hope for the best. Any good knock on the back of a peg – or just laying the frame on a flat surface so that the peg is coming into contact with the table – displaces the peg. That’s just no good. 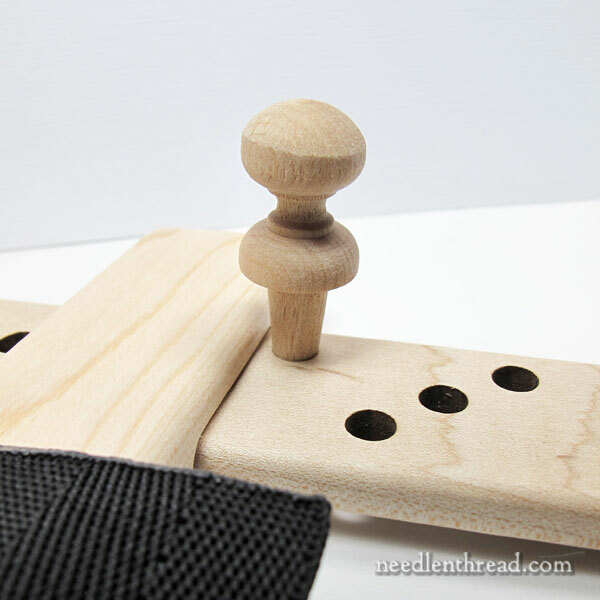 On other slate frames, the cotter pin is the peg of choice, and while it works and is a good choice (I prefer it to conical pegs), it is not as easy to use as a peg, if you have trouble with your hands. Cotter pins are small, and they can be really hard to pull out when you need to move them. The solution here? A peg that is relatively short, that has a knobby head that’s easy to grasp, and that has this interesting little shelf feature at the tip. The peg fits into the hole, and with a little pressure, it locks into it. You can lay the slate frame on a flat table, and the pegs won’t pop out. As a bonus, the pegs are pretty, too! Not every embroiderer needs a slate frame. Especially if you know your interest in embroidery is more on the crafty side and will probably pass when another craft you’re interested in comes along, then you probably wouldn’t invest in one. But if you have taken up embroidery and are serious about learning the art to your fullest potential; if you are already a die-hard stitcher; if you do long-term needlework projects (surface embroidery, goldwork, crewel work, whitework, needlepoint, cross stitch, and so forth) – then a good slate frame is worth the investment. It will last you your whole stitching life and beyond and afford you much pleasure. If you find the price tag a little hefty, this is what I do: I never buy an expensive needlework tool right off the bat. I budget for it and save little bits here and there until I can buy it. Or I put it on my Christmas list and drop very subtly-obvious hints to all parties concerned. The nice thing? They’re available in Small Sizes, too! Normally, you don’t find small slate frames, so I’m glad to see that there are some smaller sizes available. They come with a thorough instructional packet on how to set up a slate frame, plus a spool of linen lacing string for setting it up. The linen string is more important than you might realize. Linen doesn’t stretch like cotton – it’s the ideal fiber for setting up a slate frame. You can also find them available at Thistle Threads, but I think they only have one size available right now. So, for stitchers in the US who have been pining for good slate frames to be made more widely available, this is good news indeed. Put one on your Christmas list! YEARS ago, I was offered an antique slate frame, which I declined. I wasn’t doing all that much embroidery at the time, and didn’t think I’d use it very often. Really interesting to read about. Great close up photos. I doubt I’ll ever buy one, but I’d be interested in seeing a long shot of this type of frame since I don’t know what it is. I read your post this morning with great interest, Mary. Thank you! I have a friend who uses slate frames and her work is stunning. I have a small questions about the pegs: when it comes time to disassemble the frame, how do you unlock them? You just pull them out, Laura – they don’t lock tight, they just prevent the pegs from popping out if you put the frame down on a flat surface. 2. extra bulk at the sides of the fabric if it is hemmed, zig-zagged, or has a thick selvedge. When rolled around the top and bottom of the frame, this makes the edges of the fabric tighter and the middle a little saggy. I know I must be doing something wrong. Hi, Monique – most good linen doesn’t stretch, esp. if you pre-shrink it. If you’re using a blend, yes, they can be spongy and stretch over time. I’m not sure about #2 – I’ve not had that problem. I’ve always been able to stretch it to drum-taut, despite rolling it over the bars. I think it’s just a matter of working the frame, the vertical stretch and the horizontal, until it’s right. Another thing I do, after the final stretch when setting it up, is spritz it with a light spray of water and let it dry. When it dries, it has just that extra tightness that makes the linen almost hard as a board. I love it when it’s like that! Your frame – what does it rest upon? You can rest it on the edge of a table in front of you, and the front part on your lap, or you can use many kinds of floor frames to clamp it on or rest it on. There are many that can accommodate slate frames. You can also rest it on the edge of the table and put a weight on the frame, or use a clamp (from the hardware store – like a C clamp) to clamp it to the table, if you want it parallel to the floor. It’s great to hear from you again missed you. These slate frames sound really well made and a great frame, it’s good to know that they’ve finally made a good solid slate frame which actually works. I can’t get on Needle in a haystack website it keeps coming up as failed I’ve tried other ways but the page won’t open. Thanks for sharing with us the new slate frame from Access Commodities and look forward to seeing the frame set up and look forward to hearing from you tomorrow. Yes, I’m not sure their page is not loading. It was working this morning, so we shall see if that is fixed as the day goes by…. Oh yes, it’s beautiful, I also really worked pins. Have a pleasant and beautiful tool also contributes to the pleasure of embroidery, it’s a little ritual rejoicing, I do not get tired of my old hoop, it is in walnut. I’m puzzled about the “firmly woven, finished cotton twill tape.” In the photo, it looks like they melted then end to finish it, but cotton doesn’t melt. Is it finished with some kind of glue? Or is the twill tape actually something like nylon that can be melted to prevent fraying? Yes, you’re right, Nat – it is a synthetic twill, not cotton. I corrected it. Thanks! Good morning, Mary. I hope you’re feeling a little better every day. I really, really, REALLY would like to buy one of these (and probably will). The problem is my sweet husband designed and built me a trestle stand based on the ones we saw used at the Chinese Embroidery Center in Suzhou. He also made me a custom slate frame and, bless his heart, it has all the problems you outlined. Well, it IS smooth so it isn’t too awful! But how do I possibly replace it without hurting his feelings? That was a rhetorical question, really, but, oh! the thought of not having it come apart when those darned pegs come out! sigh. Hi, Denise – Maybe he can make you some kind of solution for the pegs?? That might do it? My question would be why a slate frame would be chosen over the Evertite frames? There really is a big difference, Wendi. For one thing, you can roll the horizontal bars on the slate frames, so you can accommodate much larger pieces without the reach needed, if the whole project must be exposed when it’s mounted up. For another, even though you can adjust the Evertites, there is a limit to how much you can adjust them. There is no limit to how much you can adjust a slate frame, except vertically (due to the length of the slats), but you can roll the slats to take up excess fabric. A slate frame provides unmatched tension, compared to any other frame, and over time, that tension can be maintained. That being said, I love the Evertite frames and I use them all the time. It just depends on the project. I went to Needle In A Haystack’s website and noticed that Evertite makes a slate frame. The order takes several months to complete as it is made special order. Has anyone tried these? How would you compare them to the slate frame from Access Commodities? Hi, Wendi – I have a larger one and I wrote about it here: https://www.needlenthread.com/2008/07/slate-frames-for-hand-embroidery-yippee.html The difference is that the rollers are actually round, not flat, which is fine, but because of that, they are very heavy. They also don’t work in any clamp-on type frame. The pegs are cotter pins and the peg holes are quite small. This does allow tightening in smaller increments, but it’s more difficult to remove and adjust the cotter pins. Overall, the frame, while very well made and beautiful, is very heavy, so the only possible solution for supporting it is a good set of trestles. It doesn’t work on any other stand that I have, whereas the lighter frames work on the Needle Needs stand, Judy O’Dell’s stand, and in my NWS4 frame clamp. I have failen in love with the Evertite frames for keeping a piece taut for long term working. How would you compare the slate frame to these. I know the setup is longer on the slate frames. Well, nothing really compares to a slate frame. But I do use the Evertites as well, for smaller, quicker projects. Oh, yeah! Thank you so much, Mary! The link you provide to Needle in a Haystack just spins for me. I’ll try it from home to see if I get a better response. I think they’re having a website problem…. Thank you so much for this article. I’ve just bought my first slate frame and it has several of the problems you talked about. Once I get the fabric taut it’s not too bad although the pegs do not want to stay in place. I might have a go at modifying their shape so that they will lock in like the ones on this frame. I loved this article. Right now the system I have is working for me, but you make slate frames so tempting! I looked at the Access Commodities slate frames you mentioned at Needle in a Haystack and saw Evertite slate frames for sale there as well. Have you ever tried them, or heard anything about them? This is probably a silly question, but can you use a large slate frame with a smaller piece of embroidery? For instance if you have a slate frame that is 16 by 16, could you lace in a piece that is 8 by 8? Would it work, or would you need to stick to within 2 or 3 inches larger or smaller than the frame? 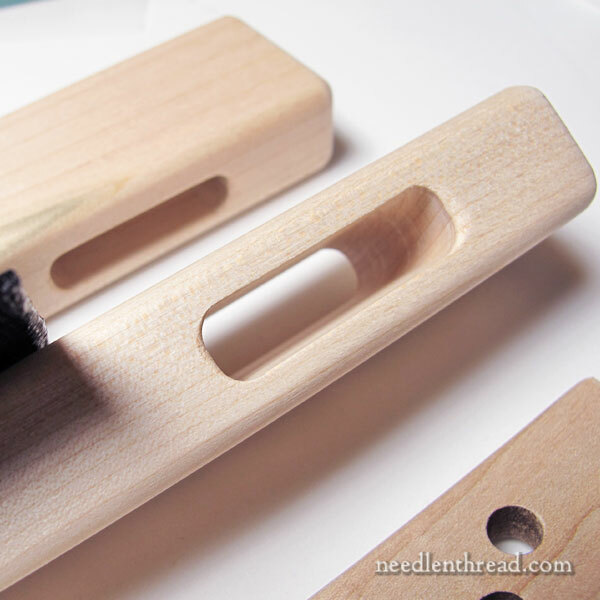 Hi, Kate – Yes, I’ve reviewed the Evertite frames here: https://www.needlenthread.com/2008/07/evertite-stretcher-bar-frames-for.html I use them all the time, for small quick projects. You can definitely use a larger frame for a smaller piece. You can either add strips of fabric to the sides, you can mount the smaller piece on a larger piece of muslin and mount the muslin, or you can just lace to the edge of the smaller piece. As long as the piece is deep enough (vertical length) for the peg holes to hold the fabric taut vertically, you’re fine. So you’ll want to know what the minimum vertical distance is that the slats can accommodate. I commented before, but I meant to ask you about the Evertite *slate* frames, not their stretcher bar frames, oops! The slate frames are all the way at the bottom of Needle in a Haystack’s page. It looks like they are custom order only. Since they make such good stretcher bar frames it really makes me curious about their slate frames. I had been reading your many references to slate frames and until today, I thought you meant slate as in stone (long a sound). LOL, I finally realized today when I took the time to look at the pictures that you meant slate (short a sound). I am new to your website and wanted to say, Thank you. I am so thankful to have found your website. I mostly find cross-stitch embroidery projects and did not want that. I had a few ideas, but wasn’t sure how to execute them. I now have a pathway to bring them to life. I have been researching all the different frame types recently mainly by reading your reviews and had just decided to invest in a millenium frame. After reading todays article I could use some advice on which way to go. The slate or the millenium? I like both, for different reasons. The Millenium doesn’t take as long to set up. And it provides good tension in the working area, but not as good on the very edges on large projects in some cases. The slate frame gives consistent tension horizontally and vertically, all the way to the edges. The mechanisms on the Milenium frame are much more complex, so there’s more of a chance of something going wrong with them. The slate frame is very simple in construction. Not much can go wrong with them.nfor a long term project, I always choose a slate frame. For shorter term projects, I’ll go either way – it just depends on what I’m doing. I,too, looked at the Needle in a Haystack site and saw two brands of slate frames–those made by Access Commodities and Evertite–and wondered how the two brands compared. Thanks for the input on slate frames. I have not tried the (for lack of a better word) double-button peg, will need to look into them. Not sure about the webbing tho, it looks a little hard to get a needle through for attaching the fabric. And Birch is a good wood for these, light and strong :). Thanks again! Thankfully I have a lovely slate frame……I could never understand a,why they were so difficult to get hold of in America…..and b, why so expensive ? Any way , this looks like a real beauty ! I think a big reason is economy of scale. They aren’t a very well known type of frame in the US so there isn’t a big demand for them. I would guess that less than 1% of our customer base have ever heard of one. And finding wood workers who are willing to make them is also hard. I know Access Commodoites has been working on trying to get them made here in the US for a few years. We’re thrilled that it has finally come to fruition, even if it’s in limited sizes. But the sizes needed for Tricia’s casket class is what has helped drive enough demand. Pricing is all about time and effort to make them so if it were some big company manufacturing them the prices might be lower. But like the Millenium frames, this is a cottage industry – like 99% of needlework related businesses. Previous Previous post: Glorious Goldwork and Pearls! Next Next post: Fall Stitching, Anyone?